Emily Wilson is a poet focused on minutiae and the undersides of things. 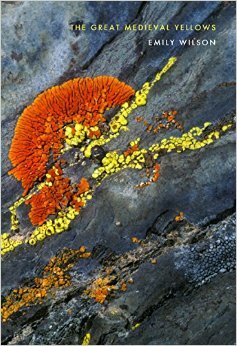 The cover of this book is a detail photograph of lichens growing on stones, which is an apt way to think about Wilson’s poems in The Great Medieval Yellows. The epigraph of the book, where the title comes from, refers to the yellow and gold pigments used in medieval painting. “The great medieval yellows,” likewise, are details from a larger work. Wilson’s poems hover over particulars, zooming in as far as possible until the thing itself is blurry and changed. The sharp language here—“pierced,” “stingers,” etc.—hint at the precision of a microscope. For Wilson, the microscopic isn’t just a way of looking at something; sometimes it is the thing itself. Here, Wilson uses a late-Middle English verb-form of the word “scut,” meaning, “to shorten.” “Antagonies” and “parsimonies” Wilson created from the words “antagonist” and “parsimonious.” The heavy enjambments in Wilson’s poems force the reader to examine her diction searching for new meanings in these skittish lines. The effect of Wilson’s precision is an indistinct picture, often focused on images “tendered ‘from nature,’” that leaves the reader breathless and wondering. Her “jitter-lines” are like trying to look at something too close that just won’t snap into focus. In this way, Wilson’s voice is singular and kaleidoscopic, which is to say bright and shifting. What other writers are stretching the uses of their language and phrasing?